Our female bodies mirror the cycles of the natural world in a way that I’ve always found amazing. And if you’ve been around here long, you probably know that the moon is my favourite symbol of the physical, emotional, and spiritual phases we pass through each month with our menstrual cycle. Like the moon we women have distinct phases. We wax and wane from light to darkness, from the fullness and fertility of the follicular phase to the withdrawn interiority of the luteal phase. Respecting and flowing with the movements of our own menstrual-moon cycles aligns us with the natural wisdom inherent in our bodies. Regardless of how your menstrual cycle aligns with the moon in the sky—whether you bleed with the new moon (called a White Moon cycle), the full moon (called a Red Moon cycle), or somewhere in between—you can use the symbol of the moon to help you understand your own emotional, physical, and spiritual ebbs and flows. The dark of the new moon symbolizes the quiet, internal menstruation phase of your cycle, the phase of the wise woman. The energy of our bleeding time is intuitive and deeply spiritual. During this phase our awareness is diffuse. We’re more attuned to the spiritual than the physical realm, so time spent in retreat from the demands of everyday life can provide transformational wisdom. Practice extreme graciousness with your body and your heart during menstruation. Carve out time to be still, listen, realign your perspective, and receive guidance for the month ahead. It can be challenging to make space for this kind of stillness—most of us are overrun with obligations that don’t have a pause button—but even half an hour of conscious connection with your inner self during this phase can open you to deep emotional release and spiritual renewal. The crescent moon symbolizes the energy of the Maiden, the pre-ovulation phase that brings you new enthusiasm, mental clarity, and physical vigor. The Maiden brings out your get-up-and-go energy, and you’ll find yourself ready to take on new ventures, outline goals, and develop new ideas. The energy right after we bleed is all about rebirth, new enthusiasm, mental clarity and physical vitality. It’s an ideal time to repeat positive affirmations and plan for the future you desire. In the Maiden phase, anything is possible! 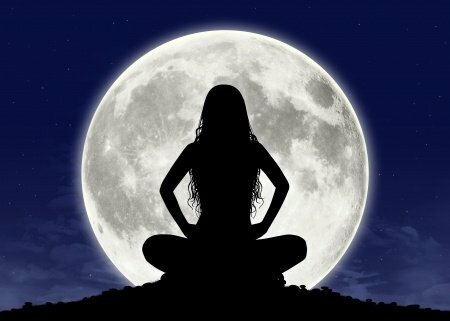 Ovulation ushers in the nurturing and supportive energy of the mother, bright and fertile as the full moon. The hormones that peak in the body at ovulation create the perfect environment not only for the support of a fertilized egg but for the nourishment of our dreams, ideas and goals, our “creative children.” This is a time of full creative expression, when we’re most capable of nurturing ourselves, our loved ones, and our deepest desires. Our energy has shifted from a mental focus to a strong emotional focus. This is the time to reach out, to bond, to discuss problems, to nurture your relationships, and to reconnect on the deepest emotional levels. Once the crescendo of the full moon is reached, its appearance and its energy begin to withdraw. Farmers and gardeners consider this period the ideal time to weed, prune, and harvest. For us as women, our personal waning moon after ovulation provides a natural time to turn within and take stock of how you’ve grown during the past cycle—to sift through your experiences, to journal, to discard what no longer serves you. It is said that right before menstruation the veil between the physical and spiritual worlds is thinnest. This pre-menstrual enchantress energy can be emotional, wild, unpredictable, and powerful. As hormones shift in the body with the completion of ovulation and preparation for menstruation, we become more introspective and reflective. Allow yourself to feel, without judgment, the pain that stays buried the rest of the month. It’s important not to ignore our powerful feelings at this time because they can give insight into the truths we’re unconscious of in the more outward phases of the cycle. Yes, I want the meditations! Hi Zahra, so if I ovulate on the New Moon (the day I was born was a New Moon) does my body follow the pattern and meditations above or will it be the other way around? This is very new for me and I am getting a bit confused. Thank you. Hi Jana, if you’re ovulating with the New Moon and getting your period with the full moon, you would follow the pattern of the meditations ‘other way around’, meaning you follow your own body’s pattern, not the moon in the sky. Hope that’s clearer now! Check out our Moon Charting Mastery Program for more help with this!